I am very aware that I have not written anything for some time, either on Facebook or on our Website, regarding us and any ministry developments. What I want to share with you now may give you some understanding as to why. At the beginning of this year I was at an event in Belfast. At one point the speaker talked about people there who had unfulfilled dreams regarding things that God had spoken over their lives and that God had not forgotten them. While I knew this, it was nevertheless a confirming moment! It was also around this time that I had what I believe was a clearly spoken word by God directly into my spirit. Three simple words: “Empty but full.” I knew instantly what the statement meant. Empty: It is that narrow stripping place that God said He was taking me into when we were leaving Rostrevor. It is hard to believe that it is now over 6 years ago! In part, we were very much in need of a break after 18 years in residential community/ministry life. It was also good to be back in Belfast, as my ageing mum was needing a lot more supervision and had periods of hospitalization – earlier this year she “crossed over” to the immediate presence of her saviour and friend – Jesus. Empty, also because the last family member has now moved away from Belfast! Nigel, now happily married to Kyria, has moved to Michigan where he is in the process of building their own home – such a turnaround from his years of debilitating Chronic Fatigue! Our Heavenly Father is truly the God of restorations. We are also able to visit both Dorothy’s dad and the family more frequently in Kilkenny (he has recently celebrated his 96th birthday) and Rachael, Jan and our first granddaughter, Lydia, in The Netherlands. Cheryl, a bit further away, is believe it not, eleven years in Sydney and is now a true Aussie, having recently obtained her citizenship. It was soooo good to have them all back home during the Autumn – and nearly all at the same time! For me the word “empty” has also had another dimension. It has meant no ministry title; no leadership role; no voice or intercessory burden regarding Ireland; no writing or promoting of a vision of prayer/reconciliation here and very few opportunities to speak at meetings. This was my life, my ministry and it became without noticing it – my identity. I am still aware of incomplete issues, such as the Ulster Covenant and Church repentance, but at present, I have no sense of God calling me to pick them up and run with them. It has been hard at times to be around people I ministered deeply with over many years, to find that the things that connected us are no longer there. It has also been strange to be in a lively progressive church that has great teaching, anointed worship leaders and a heart for Belfast, and is calling us to own the City and intercede for it and yet not feel much regarding it. Initially I tried, how I tried – I used to live this stuff and teach it and call others into it and yet He has lifted it all off me. If I am honest, my motivation was wrong, I was trying to embrace it because I needed an identity and God was saying – lay it down, I want to be your identity! I have at times been given the opportunity to share with individuals and encourage them in ministry but I know that at present I am not to be in leadership here in Ireland. Who knows, that may change but it’s not for now! Yet, everything that God had put in my heart to pray and do over the years regarding Ireland have not been wasted, they have been an integral part of my journey, they are woven into what God is doing in my life today and for tomorrow. Even, regarding my book “Heal Not Lightly” – though written 10 years ago – I have been surprised this year by the number of people who have recently read it and told me that it is still as relevant for Ireland today. There is still much unfinished work to be done regarding its content. God still wants the River of His Spirit to flow across this wee land of Ireland! Let me know if you want a copy. Full: Something sits profoundly, deep, full, in my heart regarding Native American reconciliation issues, as real as anything that I have ever carried for Ireland! There is so much of English/Scottish/Irish history that is repeated in parallel ways in North America as English/Scottish/Native American history – land removal, genocide, Doctrine of Discovery, Manifest Destiny, broken covenants. 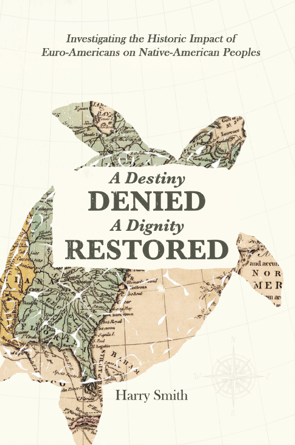 I can honestly say, that in the research for and writing of my near completed book, “A Destiny Denied, A Dignity Restored”, I have probably read more and know more about the formative years of what became the United States of America – it’s spiritual roots and the European soil in which they grew – than most people in the States! This is a message that God wants to get out there to Christians in the UK and the USA, who need to embrace His heart for the many Native American nations and the healing He has for them. Regarding “full”, I am not long back from a short prayer and reconciliation trip to Providence, Rhode Island and Plymouth, Massachusetts. It was soooo good to be back on American soil to meet some special old friends and embrace new ones. It seems that the moment I step off the plane my spirit comes alive to what God has put within me: so many great conversations; opportunities to briefly speak at a number of meetings; stand, pray and weep with a Native brother at the site, where his tribe had experienced genocide (The Great Swamp Massacre of the Narraganset) and join with others at the memorial site of the establishment of the Pilgrim Fathers first colony – to pray, gain further understanding of the repercussions of their presence there and repent of some of the negative ones. And strangely, it would also seem that something shuts down in me as I board the plane to return home! When we left the Renewal Centre, God also made it abundantly clear that we were not to step out and try and make the next phase of our ministry happen. That would have been my tendency, having been trained to pioneer and establish a ministry from scratch. I sensed that God was saying, “Your ancestors went to America uninvited, you are to go in an opposite spirit. I will give you the relationships and the invites.” And certainly, sitting here in Ireland, it is hard to know where to begin. So far, we have a number of relationships formed right across the States and with the near completion of the book come thoughts of: how does one get it published and distributed on both sides of the Atlantic? This has to be a work of God. The USA is huge! I often ask myself, “Lord, what do I do with this fullness?” At a Culture of Honour Conference earlier this year in Belfast, Jason Upton was leading some of the worship. During every session he sang Ben Smith’s song “Mountain to the Valley”, which profoundly spoke to me (really worth checking out on YouTube)! This one thing I can’t escape – Your love. There is a tension here that I acutely feel, a tension between “Faithfully you will complete” and “When I don’t know …”. Resting in His love is clearly the way through it – in the midst of the plague, the placed desires and His spoken words! And yes, in the midst of the journey, God has continued to look after us. For those who have stood with us in prayer – thank you! For those who have continued to support us financially – thank you! Pray with us especially for the outworking of the “Full” section, mentioned above: especially for the completion of the book, a publisher, distribution networks, developing relationships, invites … and for all the relevant finances required. Dorothy joins me in wishing all of you a blessed Christmas. We both love the title associated with Christ’s birth – “Immanuel, God with us.” May you know in your “Fullness-es” and “Emptiness-es”, that this season can so often emphasise – Immanuel, in your midst.